Or as low as $138.33 per month over 6 months. Apply Now. 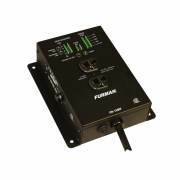 Furman CN-15MP 15A Remote Duplex, EVS, SmartSequencing Extender with 10′ Cord provides flexibility to any installation scenario by extending the benefits of SmartSequencing to electronics outside of the equipment rack. This product allows the user to daisy-chain units and fully control them via Furman’s exclusive Smart Sequencing technology. The SmartSequencing technology allows the user to remotely and safely cycle through power sequentially. It also allows large complex AV systems to bidirectionally, safely power up or down with the simple press of a button or turn of a key. With DIP switches and a potentiometer, the CN-15MP allows customization of settings such as fine tuning sequencing delays and 12V On/Off. Lending an unprecedented level of power management and control-switching options while streamlining from start to finish. This sequencer also has Extreme Voltage Shutdown (EVS) which safeguards against operation during under and over voltage conditions. It also has a cover shield which adds security and prevents unauthorized personnel from tampering with the settings. As well as a Forced Off immediate shutdown for added safety and fire ordinance compliance. With all of these features and technology, the user will have many years of trouble free operation with the CN-15MP. Furman Canada 15 Year Limited Warranty.